If I had to say what my absolute favorite way to cook vegetables was, it would be roasting. I’ve roasted just about everything: beets, cauliflower, broccoli, mushrooms, parsnips, eggplant, zucchini, peppers, carrots, broccoli rabe, tomatoes. There is something about roasting that concentrates flavors, makes everything taste better. Roasting turns eh-okay tomatoes into something great. Vegetables emerge from the oven with a little char, and a lot of attitude — the good kind. Now that it is springtime, asparagus spears have been big at the market. And I love roasted asparagus the most. To roast any vegetable, I set my oven between 400° to 425°. I wash my vegetables well, cutting them up into relatively equal pieces so that they roast evenly. How big should the pieces be? The fabulous Judith Jones had the best suggestion for this: cut your vegetables into the size you want to eat. She might have stolen that from Julia. For asparagus, you will need to trim the woody, inedible bottom ends from the rest of the stalks. How do you this? Hold the base of the stalk firmly and bend. The stalk should snap right at the point between the tough end and the tender one. To visualize this, here is a handy video clip. Discard the ends. Evenly spread the vegetables out on a parchment paper-lined baking sheet. Drizzle good olive oil over them. Sprinkle them liberally with with flaky salt (I like Maldon salt), and add a few turns of the pepper mill. With your hands, toss the vegetables together to make sure that they are all coated with the oil and the seasoning. Spread them back out in an even layer on the sheet. The roasting time varies depending on what you are roasting, and how big your vegetable pieces are. 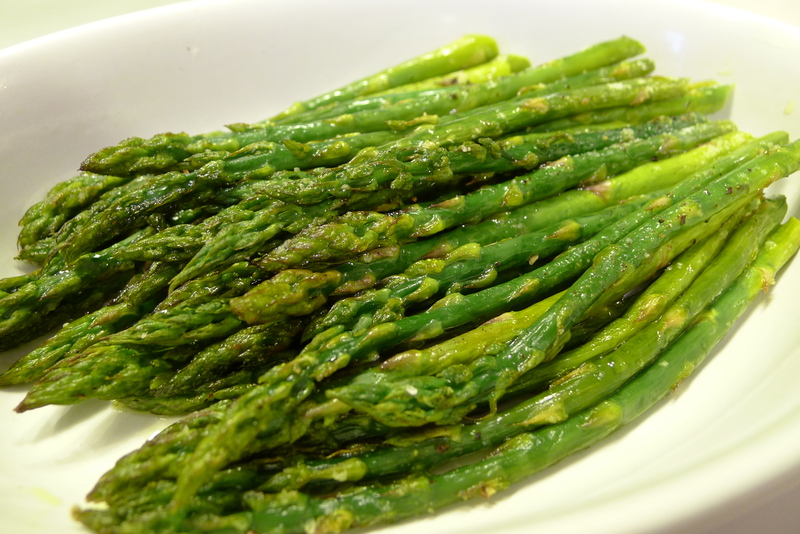 Asparagus cooks fairly quickly, no longer than 10 minutes. You want to remove the stalks from the oven when they are slightly blistered and charred — that goes for all vegetables, except for eggplants, tomatoes, and mushrooms (you want those a little more roasted). I would say experiment. Check on your vegetables after every 7 or 8 minutes. You will figure out eventually what times work best for you. After your vegetables are roasted, transfer them to another dish. The great thing about roasted vegetables is that you can even serve them at room temperature, which is great because you can roast them ahead of time and not worry about them while you are finishing cooking the rest of your meal. Sometimes, I like to grate some Parmesan on top before serving, or add a spritz of lemon juice.